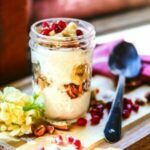 This make-ahead banana pudding yogurt parfait is a quick and easy breakfast recipe that’s perfect for those days you need to grab and go! Layers of yogurt, bananas, pecans, and vanilla cookies turn this simple morning meal into a treat. Believe it or not yogurt wasn’t really a thing in the early 1960s. Our moms sleepily poured cereal in a bowl, topped it with milk, and sat across from us drinking instant coffee with bleary eyed boredom while we read the back of the cereal box and shoveled in something sugary. This was quality time with mom back before Pinterest. Yogurt was hippy food right along with homemade whole grain breads and organic produce. Somewhere in that tumultuous time a company decided that yogurt shouldn’t just be hippy food so they began to market it to middle America and by 1980 if you didn’t eat yogurt you just weren’t cool — or healthy. My parents, who used organic gardening methods before they were cool, jumped on the yogurt wagon pretty early on. I think it was because Mom no longer had to actually pour cereal and milk into a bowl – she could motion sleepily to the refrigerator and I could get my container of yogurt and a spoon by myself. Now, of course, we’ve embraced the yogurt revolution and most people can’t imagine it not being a part of their lives. What kid doesn’t want dessert for breakfast? 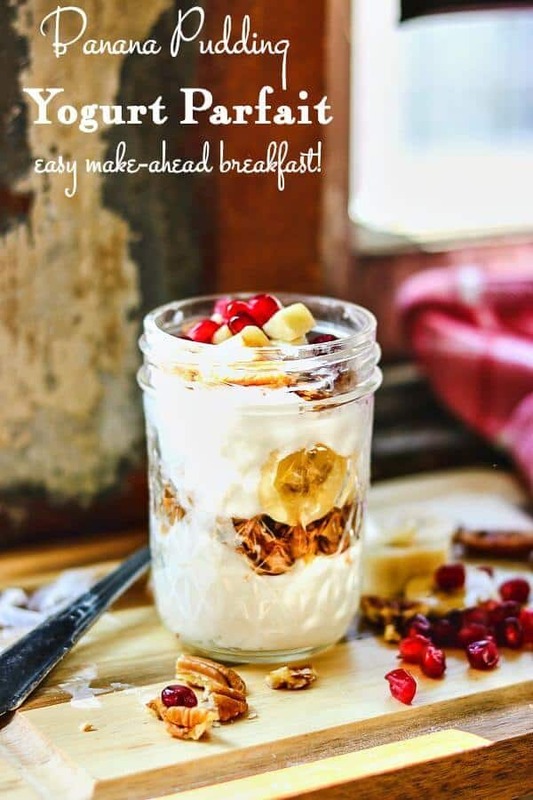 This easy Banana Pudding Yogurt Parfait sure doesn’t taste good for you! Is a yogurt parfait healthy? That all depends on what you put in it! 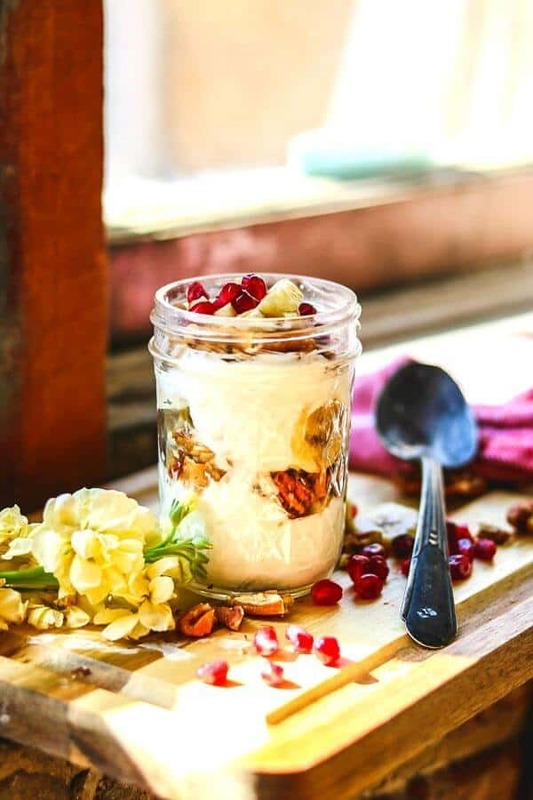 Plain low or nonfat yogurt (or yogurt with a minimum amount of sweetener), fresh fruit, nuts, granola or even a few graham crackers or vanilla wafers arranged in layers in a cup provide a lot of healthy nutrients. On the flip side of that, heavily sugared yogurts layered with chocolate chip cookies, for example, wouldn’t have the same nutritional value. The answer is that a yogurt parfait is as healthy as what goes into it. Any kind you like. If you buy yogurt parfaits at fast food restaurants they are likely to be made with creamy, heavily sweetened and flavored yogurt. However, you can make a parfait with any yogurt you like best. Try unflavored Greek yogurt sweetened with a little honey or sugar, or vanilla Greek yogurt. It’s thicker and creamier than other types and holds up well to a variety of additional ingredients. A yogurt parfait is made by layering yogurt and fruit in a glass. Sometimes a layer of granola or nuts will be added as well. Can you make parfaits ahead of time? Yes! In fact, they taste even better when they’ve had time for the flavors to blend. You can make yogurt parfaits up to three days ahead of time. You can! It’s best not to add granola or crackers to parfaits if you plan on freezing them because they’ll get soggy. Just layer fruit and yogurt in a small jar or freezer container, cover it, and freeze for up to three months. You can make this kid friendly breakfast up to 3 days ahead or even freeze it for longer storage! Making a yogurt parfait couldn’t be easier! Just follow these steps. Mix the sugar, honey, maple syrup, vanilla, or other ingredients with the yogurt. Add 1/4 cup yogurt to the glass. Carefully spoon the yogurt into the glass and smooth the top. For this recipe you’ll add chopped bananas that have been soaked in orange juice to keep them from browning. Use any fruit you like. Here’s where you add a layer of granola, chopped nuts, chopped cookies, or whatever crunch you prefer. Top with yogurt and repeat the layers. You’ll want to end with a layer of yogurt. Put the top on the jar or cover the glass with plastic wrap. Garnish with some pomegranate, nuts, granola, or other garnish before serving. There are as many ways to vary this yogurt parfait as there are people who love to eat it! Vanilla yogurt, chopped apples, raisins, dried cranberries, and pecans. Lemon yogurt, blueberries, chopped white chocolate chips, graham crackers. Plain yogurt sweetened with maple syrup, diced pears, walnuts. Peach yogurt, vanilla yogurt, gingersnaps, pecans. Vanilla yogurt, strawberries, crushed pretzels. Coconut yogurt, mango cubes, granola. Lime yogurt, strawberries, graham crackers. Vanilla yogurt, raspberries, diced peaches, almonds. Use chopped waffles for the crunch layer. 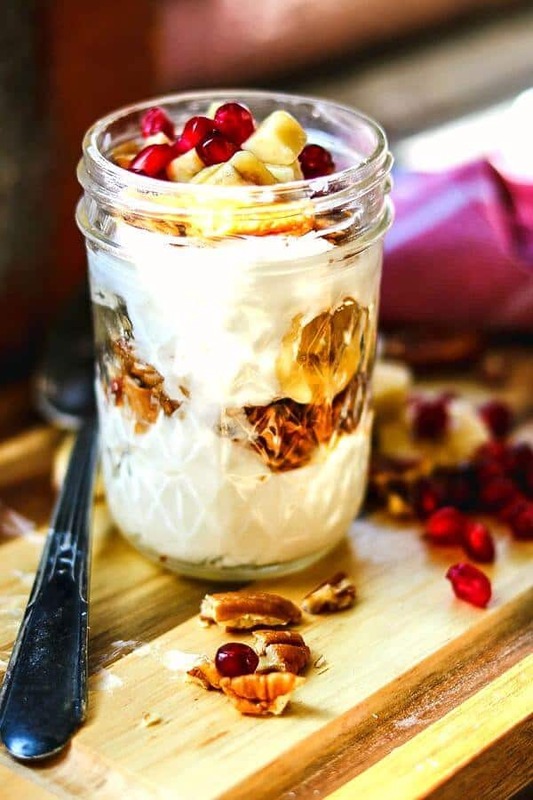 Protein, fruit, nuts… Vary this yummy breakfast parfait to suit your own tastes! 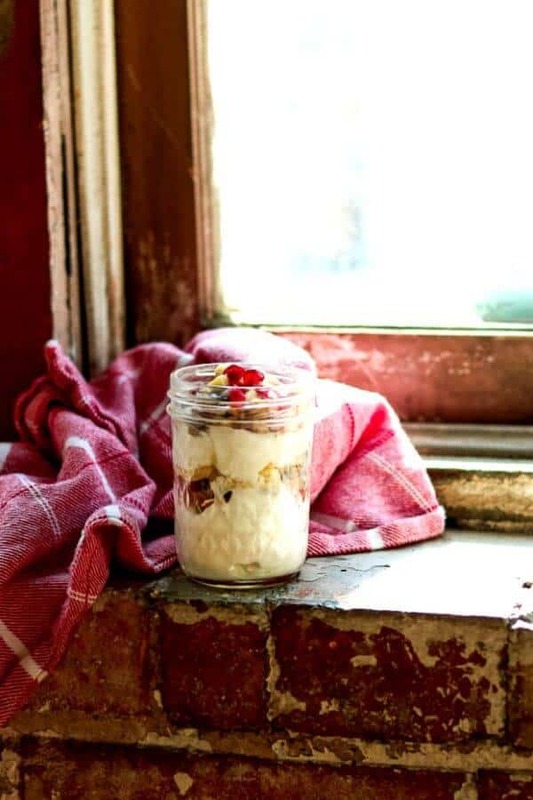 I love these 8 ounce jelly jars for all kinds of things – they’re just perfect for making these easy yogurt parfaits! Monte Cristo Casserole – All the flavors of your favorite sandwich made in an easy, make ahead casserole. Apple Fritter Bread – Quick bread with sweet apples and a whiskey glaze. Peach and White Chocolate Muffins – Tender muffins filled with juicy peaches and white chocolate bits. English Muffin Bread – So easy! No kneading required for this yummy batter bread that has the taste and texture of an English Muffin. Overnight Oatmeal – Easy oatmeal with the flavor of a classic Hummingbird Cake! I love this Cheesy Breakfast Casserole from one of my favorite blogs, Damn Delicious, and I think you will, too! If you’re looking for an easy, make ahead breakfast that the kids will love you’ve found it! Creamy Greek yogurt is layered with bananas, pecans, and vanilla wafers – you can even make it up to 2 days ahead of time! Chop or slice the bananas. Pour the orange juice over the bananas and stir gently – let sit for a couple of minutes. This will keep the bananas from turning brown. Divide the yogurt into 8 3-ounce servings. Or, eyeball it! Add part of the yogurt to 4 8-ounce jelly jars or other container. Top with 1/8 of the vanilla wafers. Add 1/8 of the bananas. Sprinkle on 1/8 of the pecans. Repeat layers ending with the yogurt or pecans – as you prefer. Store, tightly covered, in the refrigerator for up to 3 days or freeze for longer storage. You may use lemon juice instead of orange juice if you prefer.